Sustainable Conservation is dedicated to making it easier to restore California, and we’re thrilled to share the latest round of successful restoration projects that accelerate critical habitat and species recovery made possible in part by our simplified permitting efforts. We’re also working with state and federal agencies to craft new approvals that will help more restoration happen now – not years from now – so California’s 350+ imperiled species can come back from the brink, and our natural world and human communities can thrive. 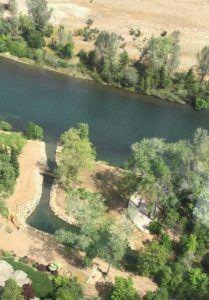 The Habitat Restoration and Enhancement (HRE) Act makes its Central Valley debut in the Upper Sacramento River with Western Shasta Resource Conservation District’s (RCD) exciting side-channel project near Anderson, CA. RCD staff and Mike Michalak, local fishing outfitter owner, coordinated construction of a new side channel, complete with native riparian plants, to provide badly needed rearing habitat for endangered juvenile winter-run Chinook salmon, and commercially valuable fall-run Chinook. 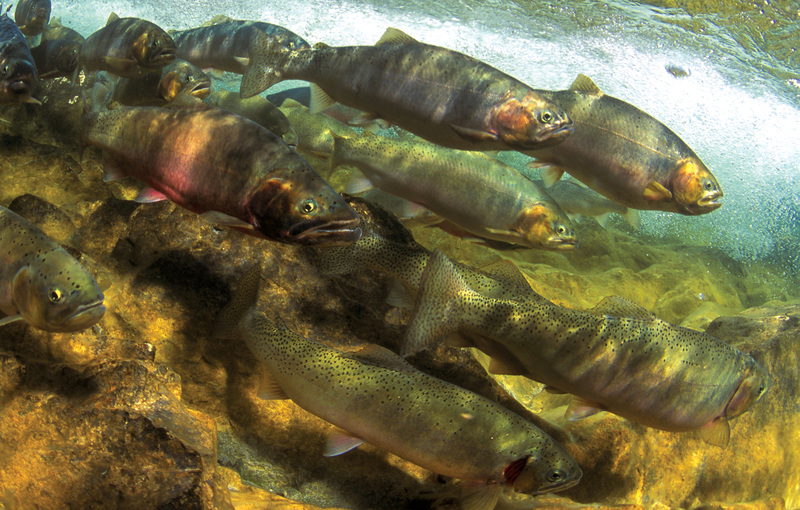 Side channels help young salmon by providing refuge from the fast river flows they have to navigate on their long journeys to and from their upstream spawning grounds. These lower-flow areas allow the fish to rest, forage for food and rear their young, so they have a better chance of making it back to the deep, cold waters where they lay their eggs, and the next generation is born. The best part? These projects work. Just one week after the side channel opened, snorkelers monitoring the stream found 8 juvenile fall-run Chinook salmon. RCD staff expect even more fish to make use of the rest stop as plants grow in and natural sedimentation gives the young salmon smaller rocks to rest between. A truly awesome start to help these critical fish populations flourish! 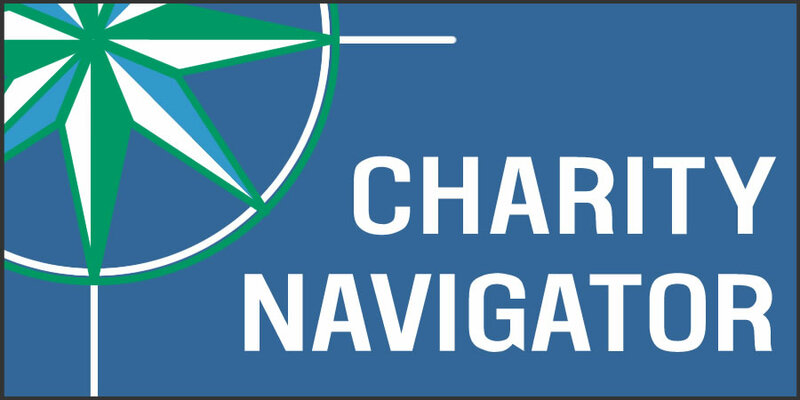 Check out the official opening of the side channel, video courtesy of Harmony Gugino, RCD Project Manager. Not so long ago, Baker Creek (Humboldt County) supported a thriving Coho salmon population until human alterations to the waterway and the surrounding forest transformed the once-thriving river into a fast-moving flush during the winter and a trickle in the summer. In-stream fish refuge vanished,and floodplains and pool habitat disappeared, making less groundwater available for slow release in the hot summer months. Sanctuary Forest’s dedicated staff and volunteers knew they could help. Since 2012, they’ve been working on a wide variety of in-stream improvements to help the struggling Coho come back to Baker Creek. Their latest project, which endured years of permitting roadblocks before moving forward through Sustainable Conservation’s HRE Act, created three acres of ponds to capture runoff and enable shallow groundwater recharge that can be released back into Baker Creek when flows are low (almost 120 days a year!). The ponds complement Sanctuary Forest’s in-stream efforts to restore large woody debris that slows fast-moving water and creates complex habitat and rest stops for struggling salmon populations. Baker Creek is part of the Mattole River watershed, which historically supported a wide variety of habitat types for fish and many other creatures, and the river still flows north, un-dammed, for over 60 miles from Mendocino County to the Pacific. Without the diversity of floodplains, side channels, groundwater recharge and in-stream wood, salmon have no refuge from warm flows, scouring from flood events or excess sediment, and their populations have dwindled. 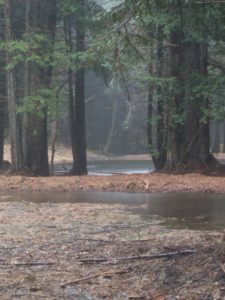 Continued restoration efforts that mimic natural processes, like falling logs and shallow ponds to enhance flows, help the watershed and local Coho rebound. One of the beaver dam replicas on Sugar Creek. Photo: Betsy Stapleton. 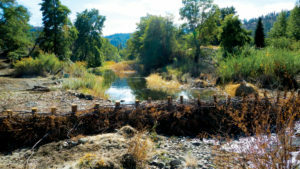 Last year, we reported that Betsy Stapleton, Board Chair of Scott River Watershed Council, and partners were working in Northern California’s Klamath Basin community to install beaver dam replicas, low-cost woven lattice structures that mimic natural beaver dams. We’re pleased to hear of another beaver dam replica project on Lower Sugar Creek, a Klamath River tributary, that was just permitted this month. The projects help endangered winter-run Chinook salmon and the basin’s unique Coho salmon population by slowing river flows, keeping water cool and reestablishing critical floodplain habitat for the young fish. As with the previous replicas, the restoration advocates took advantage of Sustainable Conservation’s HRE Act to speed approval of their critical work. Because the Klamath Basin boasts its very own subspecies of Coho salmon, keeping these populations viable is critical both to the watershed’s health and to modeling fish recovery for the rest of California. And, because the local beaver population is still present, although diminished by fur hunting in earlier centuries, the dam structures are an opportunity to help out the furry engineers with pre-fab habitat to take over and maintain over time. Thanks to the efforts of restoration-minded folk all around California, salmonids continue to get a leg up on recovery. With each fish passage barrier that’s removed, stream that’s restored and habitat that’s expanded, these key species have more and more of a chance to not only recover, but flourish.